Phoenix Party Bus offers Lincoln Navigator Limo for traveling in style and ultimate luxury. 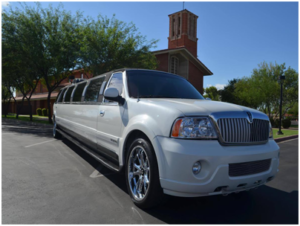 Whether you want a limo service for a corporate transportation, airport transfers or for any special occasion, we can provide you with our luxurious Lincoln Navigator Limo service in Phoenix and Scottsdale, AZ, chauffeured by a professional chauffeur. Our Lincoln Navigator Limo can accommodate up to 14 guests. And we can handle all your transportation needs. Our Lincoln Navigator keeps the entertainment going with its amazing features. It is the perfect way to travel in comfort and luxury.